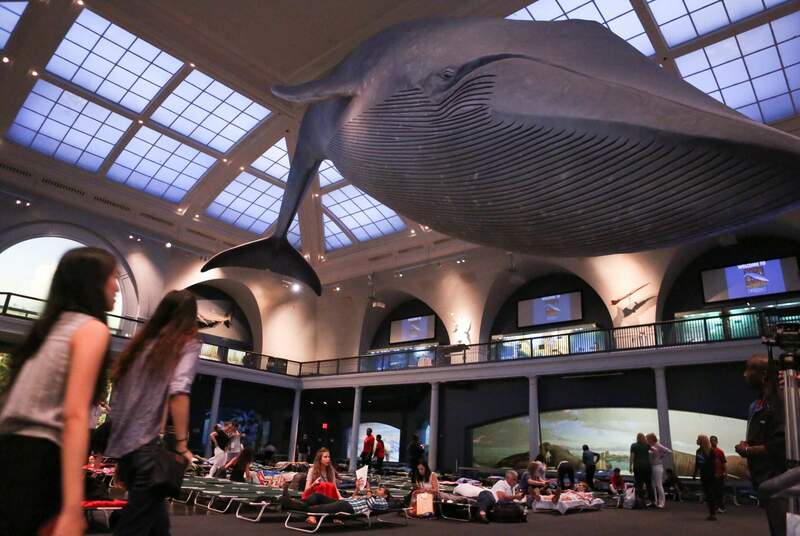 Visitors at the American Museum of Natural History prepare to spend the night under the blue whale exhibit in the Milstein Hall of Ocean Life during the adult-only sleepover on June 22 in New York. The event became so popular that other science centers around the U.S. followed suit. Aquariums and museums in cities such as Atlanta, Milwaukee and Portland, Oakland, have hosted their own pajama parties for grown-ups. 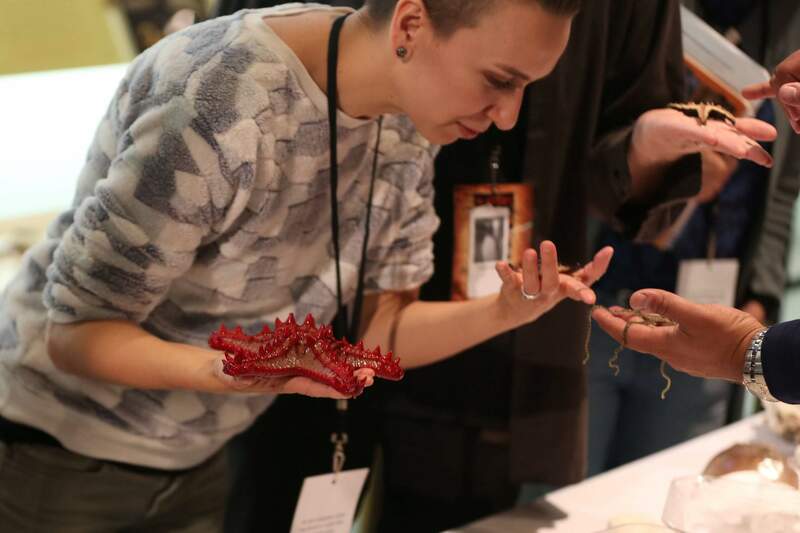 Marine biologist John Karavias, right, shows visitors the anatomy of a sea star at the American Museum of Natural History during the adult-only sleepover. “When you go to these at night, all the background noise is quieted down and you’re able to digest the science behind everything that you’re looking at,” Karavias says. 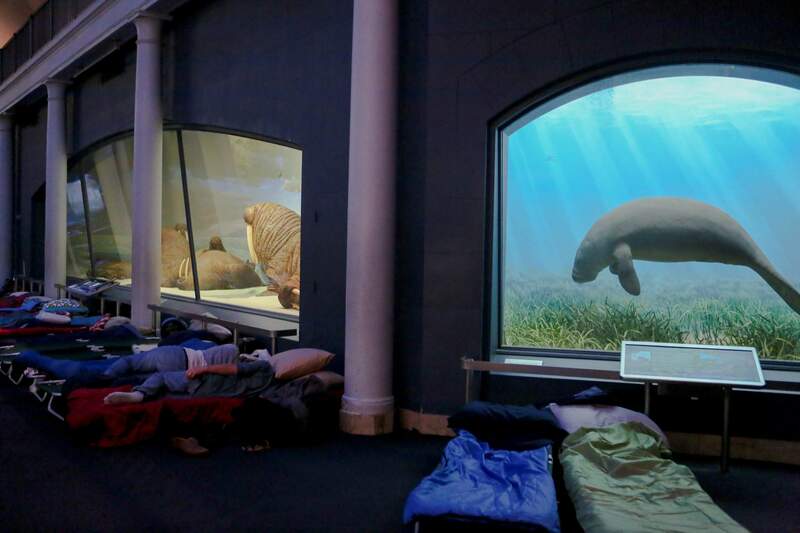 Visitors sleep under the light of dioramas during the adult-only sleepover at the American Museum of Natural History in New York. It started out as an event for kids, but in 2014, the museum allowed people 21 and up to explore its darkened exhibit halls. NEW YORK – Sometimes, in the middle of the night, nocturnal creatures are allowed to roam the halls of New York’s American Museum of Natural History, free from shouting and swarming children. They are adult humans, known to sometimes quietly contemplate science with a cocktail. 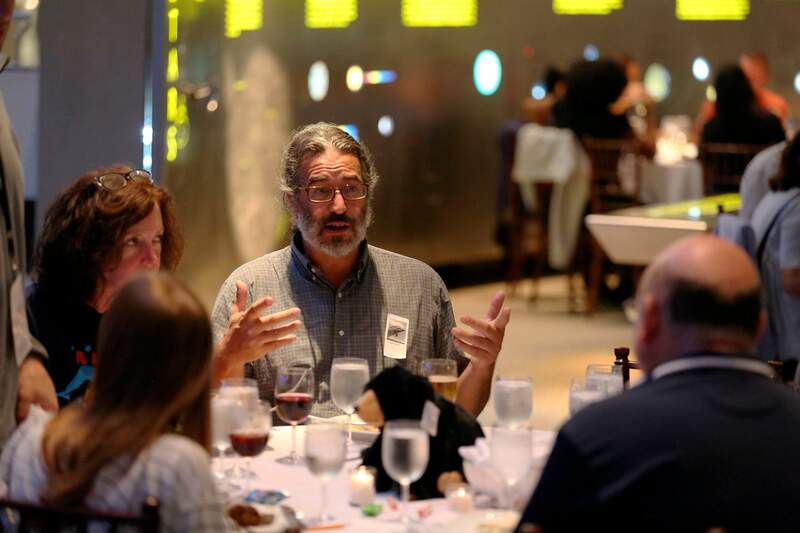 On a June evening, 175 grown-ups signed up for a slumber party at the New York museum, which has capitalized on the hype created by Ben Stiller’s “Night at the Museum” franchise. The museum’s first sleepovers were aimed at kids. Then in 2014, people 21 and older were invited to explore its darkened exhibit halls. 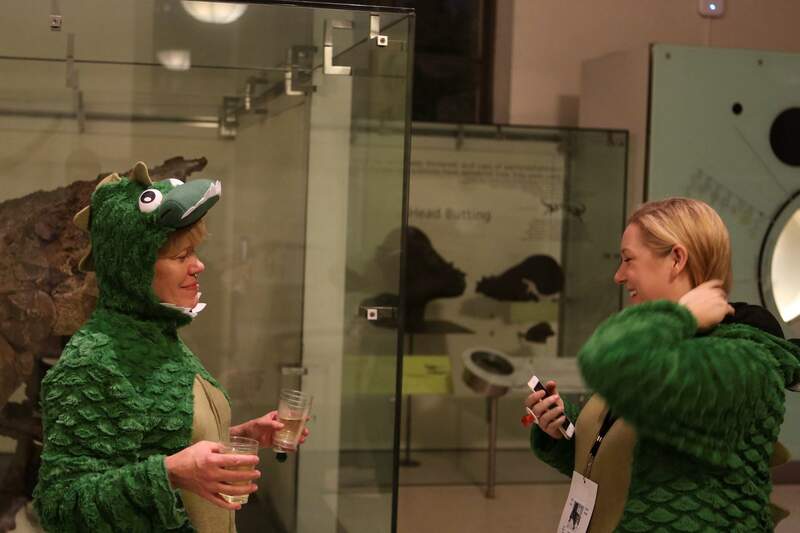 Monica Seebohm, left, and Renee Brown explore the Hall of Ornithischian Dinosaurs in their Tyrannosaurus rex onesies during the adult-only sleepover at the American Museum of Natural History. “We like to dress for the occasion,” Seebohm said. “When I saw that we could do it and that there was also alcohol, we were like, ‘Oh my gosh. Someone read our diary,’” said Janine Agarwal, 29, who attended the sleepover at the American Museum of Natural History to celebrate her husband’s birthday. The experienceDuring the night, guests have dinner in a room full of moon rocks and a 15-ton meteorite and can wander around the 45 permanent exhibition halls. They can also join guided tours, visit the planetarium, meet with curators and chat with museum scientists about their research – all while the city rests. 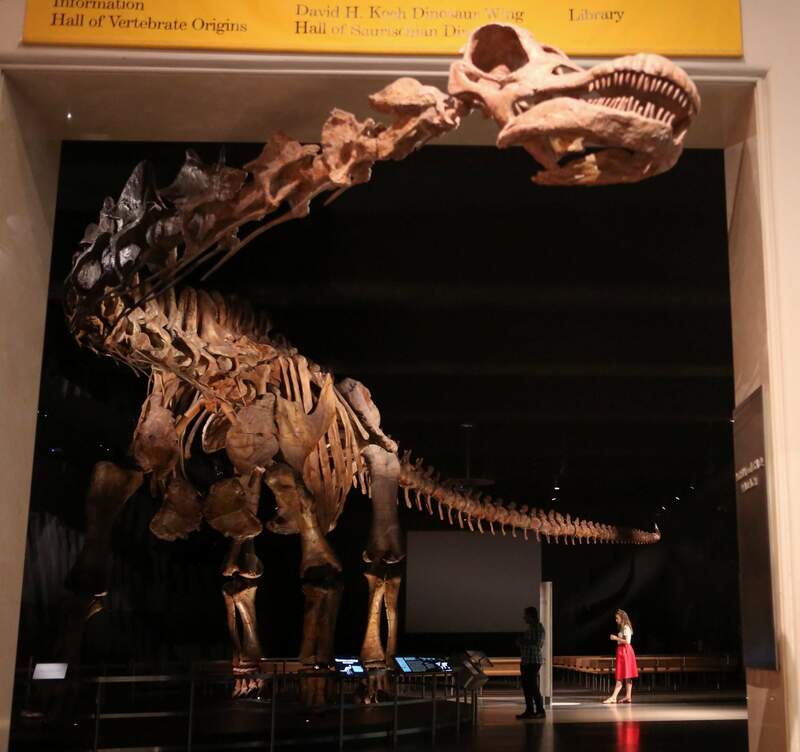 Janine Agarwal, right, stands next to a 122-foot-long model of Patagotitan mayorum, a giant herbivore dinosaur that lived in Argentina 100 million years ago, during the adult-only sleepover at the American Museum of Natural History in New York. She attended the event to celebrate her husband’s birthday. While only adults are allowed, there is still childish fun to be had. Monica Seebohm and her friend, Renee Brown, came in hooded T. rex onesies. The science behind itSilence greets those who venture into remote exhibits. That stillness makes a difference for visitors hoping to learn something, said biologist John Karavias. 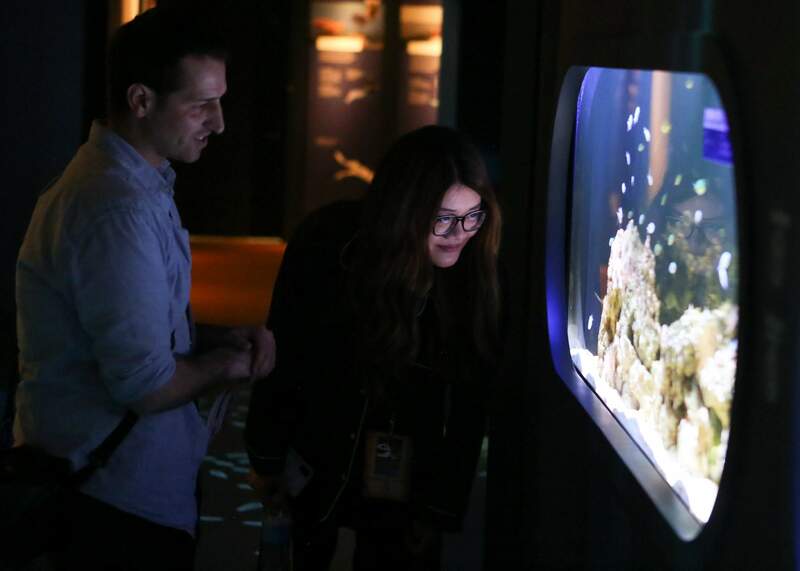 Giancarlo and Cheryl Bruni look at a fish tank in the Unseen Oceans exhibit at the American Museum of Natural History during the adult-only sleepover in New York. It started out as an event for kids, but in 2014, the museum allowed people 21 and up to explore its darkened exhibit halls.